on August 1, 2012 at 12:49 am | Reply What Comes Next? I like the effect with repeating the pattern in a few squares – nice! really like your concentric circles in the lower left – the curves in the tile is very effective. 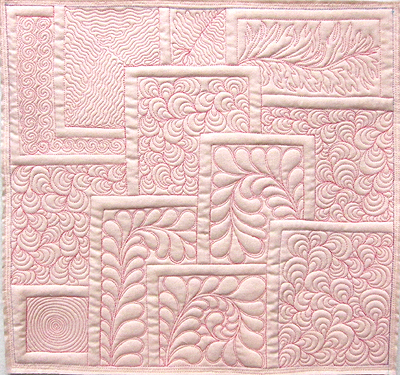 Curves and circles set in contrast with straight lines make up ‘some of my favorite’ free motion quilting designs. And the partial pattern repeat did work pretty well; I was thinking the sequencing of interior fills could be made into a secondary design – with a little more planning ahead. Thanks for your comment! on August 1, 2012 at 4:07 pm | Reply Janet O. Thanks, Janet! Straight lines do take a little practice – (stitching in the ditch using your free motion foot is excellent practice!). I stitch slowly and try to remember to breath. 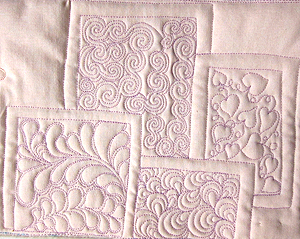 The side-to-side straight lines are definitely more challenging, so I suggest straight line quilting towards you and away from you to start. Keep practicing!